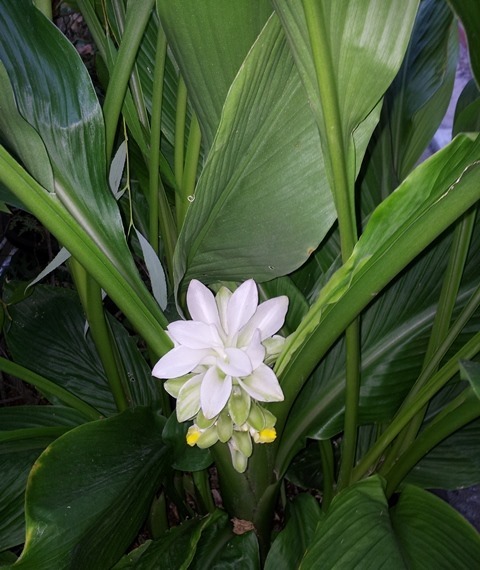 Turmeric (Curcuma longa syn. C. domestica) is a member of the ginger (Zingiberaceae) family. It’s a subtropical/tropical plant native to Southwest India, and has been grown traditionally as a spice, medicine and as a source of bright yellow dye. The root of the turmeric plant has been used in Chinese and Indian Ayurvedic medicine for thousands of years, and now we’re seeing a growing interest in turmeric in the western world due to its incredible health properties. It possesses powerful anti-inflammatory, anti-tumour, and antioxidant properties, due to its curcumin content. Ground turmeric root is an important culinary spice, curry powder contains up to 25% turmeric, and the yellow food colouring agent E 100 is actually curcumin derived from turmeric. Technically, what is commonly referred to as the root of turmeric is a rhizome, as it’s a horizontal underground plant stem, a form of creeping rootstalk that can produce shoot and roots to create new plants. Turmeric is a perennial plant which prefers rich, moist soils in a protected, shaded position. It’s drought and frost tender, which means that it doesn’t tolerate drying out or exposure to frosts. 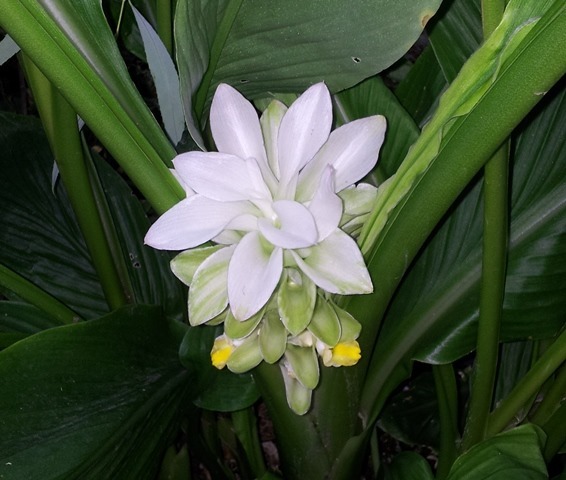 The plant grows to 0.5m high x 0.5m wide, and produces an attractive fragrant white flower. It grows perfectly well in pots and containers. In tropical and subtropical climates its a relatively easy plant to grow. What if you wanted to grow turmeric way out of its climatic range, in a temperate climate for example? What considerations would we need to pay attention to? In subtropical and tropical climates, the summers are hot and wet, the winters cooler and drier, so subtropical and tropical plants want lots of water when there’s lots of heat, and very little water when the weather cools down. If these plants get too much water in the cooler seasons, the roots tend to rot quite easily. Now, if we look at the temperate climate patterns of water and heat, we find that the summers are hot and dry, and the winters are cold and wet, quite the opposite of what plants like turmeric want! If we try to grow turmeric in a garden bed the same we grow any other plant in a temperate climate area, the leaves usually burn badly in the summer heat and the plants struggle with insufficient moisture when the soil dries intermittently. When winter comes, the plant dies down to the ground, and that’s the time to harvest the valuable rhizomes. If we replant some of the rhizomes for next years crop, they rot away in the cold wet soil by the end of winter. To successfully grow turmeric in a temperate climate, we need to replicate its native growing conditions as much as possible. Sure, we could use an expensive greenhouse to do the job, but that’s not always practical or cost effective. 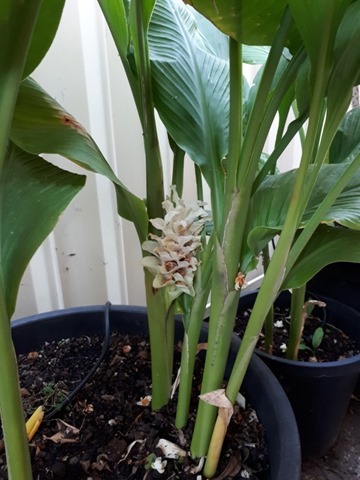 I’ve managed to work out how to successfully grow turmeric in temperate Melbourne, Australia over consecutive years without any troubles, and with quite high yields, and I’ll share how its done. Turmeric plants can be sourced from garden nurseries that sell exotic edible plants, or from fellow gardeners. 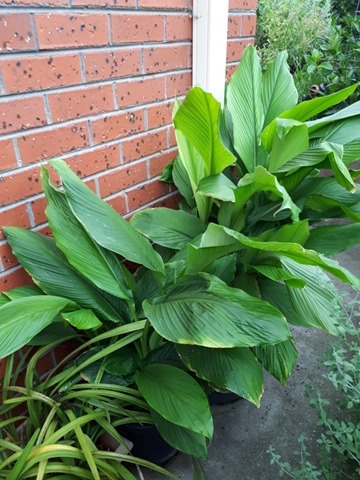 In late spring (around November in temperate southern hemisphere Melbourne, Australia), when the risk of frosts has passed, plant your turmeric plants in a pot. A 30cm (12”) wide pot works well, a 40cm (16”) wide pot is even better, and use a good quality potting mix or potting medium. It’s preferred to start with a plant because it’s guaranteed that it will definitely grow! Gardeners often ask is if they can use shop-bought turmeric roots to grow their plants. The answer is generally yes, as long as the rhizomes haven’t been treated with a plant growth regulators which act as sprout inhibitors of stored bulbs (such as maleic hydrazide potassium salt commonly used on potatoes and onions). If you’re using turmeric plants, they should be replanted/repotted to the same depth as they were in their original pots, no deeper or shallower. Water in with seaweed extract to stimulate root growth and to better help the plant establish. Most potting mixes contain around a three month supply of fertiliser, after that the plants will need regular feeding with a balanced organic fertiliser. 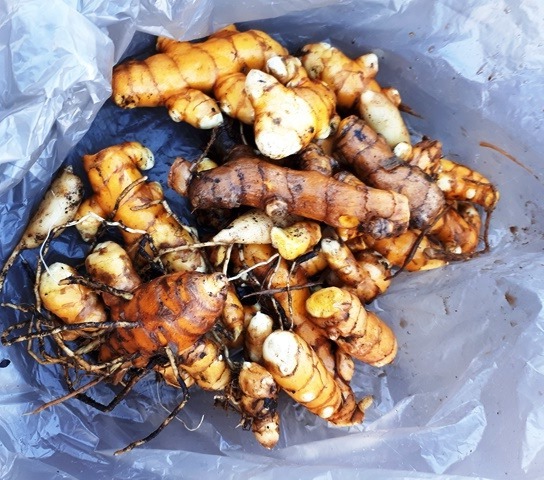 If using turmeric roots (rhizomes), dig a hole 10-15cm deep in the potting mix, place the rhizome in the hole with any buds or shoots pointing upwards and cover it with more potting mix. Water in well with seaweed extract once again, and just keep the potting mix barely moist until the first leaves emerge above the potting mix. 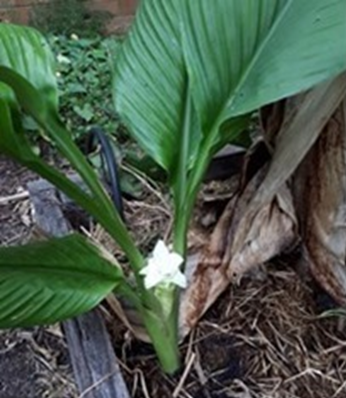 The planting of turmeric rhizomes is done in early spring in temperate zones, but turmeric can be planted at any time of the year in the tropics and subtropics. The best location for turmeric plants in pots is on the east side of the house, where they will only be exposed to the mild morning sun and little midday sun, while being completely protected from the hot harsh afternoon sun. As the plants grow, feed them with manure or a balanced organic pellet style fertiliser every 6-8 weeks, as these are slow-release fertilisers which provide ongoing plant nutrition. The phosphorus content is important for root development. Don’t use water soluble fertilisers as these are usually fast acting but wash out, they’re much better used as an additional boost or supplement to slow release fertilisers, not the main source of nutrients. During the warm seasons, the plants will put on considerable leafy growth, and having wide leaves, they transpire and lose more moisture to the air, so it’s important to keep them well watered, but don’t sit them in trays of water or pot saucers as that will lead to root rot! Turmeric will grow perfectly well in a pot and will even flower if well-cared for! As the plants grow, the rhizomes underneath will not only grow but also multiply, increasing the number of plants each year. To propagate turmeric, simply divide the rhizomes when the plants are they’re dormant, which ids when they’ve died down to the ground. Keeping turmeric growing in warm weather is easy, but keeping turmeric alive in the cool seasons is the real challenge in temperate climates. From the end of summer through to autumn, the turmeric plant leaves will begin yellow and die down in temperate climates, and the rhizomes will go into dormancy. This is the time to harvest the rhizomes, just dig them up, takes all the big rhizomes for the kitchen, and replant all the small rhizomes for next year’s crop. I managed to harvest around 2kg of turmeric root from two 40cm pots, they’re very productive, like most root crops. Now, for the secret that I discovered for keeping turmeric alive over winter – keep the planted rhizomes just barely moist to prevent them rotting. But how do you do control moisture levels in cold, wet, rainy winter weather with extreme downpours? The simple solution is to place the pots under cover, where they wont get rained on! This way the gardener decides when the plants receive water, rather than the cloudy skies! In Permaculture, one of the design principles is the attitudinal principle that “Everything Works Both Ways”, what is seen as a problem can be viewed from a different perspective, to recognise it as something useful and positive. The most common problem location in most houses when doing a garden design is the area under the eaves of the house, where the roof overhangs garden bed areas, creating dry areas where no rain ever reaches.It’s even worse when these areas under the eaves are concreted over! From a solutions-thinking perspective, under the eaves of the house is the perfect location to place the pots of dormant turmeric roots to keep them out of the rain in winter! When the spring weather warms up enough, the rhizomes will shoot, the rolled up leaves will begin to poke up above the potting mix and unfurl into big, strong broad leaves, starting another cycle of growth and harvesting. Turmeric root can be stored in the same way as ginger root, wash it to remove any dirt, let it dry, then wrap it in a dry paper towel, put it in a plastic zip-lock bag and squeeze all the air out. Put the sealed bag in the vegetable crisper in the refrigerator. It will last a one to two weeks this way. To store for longer periods, turmeric root can be frozen. Wash to remove any dirt, let it dry then place into freezer bags, remove as much air as possible from the bag and tie shut. Frozen turmeric root can be grated frozen (apparently it’s much easier this way) using a fine grater such as a microplane grater when required for cooking, it doesn’t need to be thawed or peeled. Just remember, it stains everything a lovely yellow colour so use gloves! This entry was posted in Gardening Information, What's New! and tagged growing turmeric, growing turmeric in Melbourne, storing turmeric root, temperate climate, tropical plants in temperate climates, turmeric in containers and pots. Bookmark the permalink. Very interesting I will try it as I love raw turmeric in food specially for stir fry. Thanks for the detailed instructions! Do you think I can still start growing in Autumn by planting the pots on my sunny north facing balcony? How about in self watering pots? You’ll get a bit of growth if you put your plants into pots in a warm, protected location, but not that much as they’ll start going dormant in winter.t’s worth a try, as they’ll resume growth in spring. Do not use a self-watering pot, in winter the potting mix will be too wet and the turmeric rhizomes will rot.